Punto banco is the world’s most popular variation of the table game baccarat, and this online version brought to you by NetEnt puts you at a professional table. It’s a game of chance, but if your luck is in, you might just beat the dealer to win your own fortune. Deposit and play Punto Banco Pro today for a taste of an old favourite Latino card game, featured in some of the world’s biggest casinos. NetEnt are a leading name in video slot development, having created a vast number of popular online games. They’ve built a global reputation over the last twenty years by continuously producing unique games, their imaginative themes capturing the hearts of players. Digital artwork featured in NetEnt slots is of a consistently high standard and fans of their games are used to being spoiled with a host of innovative additional features. Popular NetEnt video slots include Gonzo’s Quest, Starburst and Jack & the Beanstalk, but the team have also created hundreds more brilliant titles from their seven different offices around the world. Video slot enthusiasts expect the best from NetEnt and once you’ve played one of their thrilling games, it’s easy to see why. NetEnt present a stylish game that puts you at a sophisticated baccarat table, the tone set by tinkling piano music to give players an authentic and classy casino experience. The table itself is covered by a deep blue felt along with easy to follow table instructions. Players are given the option to choose their stake in multiples of 1, 5, 10 and 50, using the respective casino chips to place a bet. The game has additional third card rules based upon the sum of the cards already dealt. If neither punto nor banco achieve a total of 8 or 9, a third card will be used. For the punto, this additional card will be drawn if their total is between 0 and 5, otherwise they stand. Banco rules are slightly more complex, with actions depending on the punto’s score. When playing this online game it is not necessary to understand all third card rules, as play is automated to make things easier. The winning hand is declared after all cards have been dealt, with 5% being deducted from your payout if you won by betting on banco. 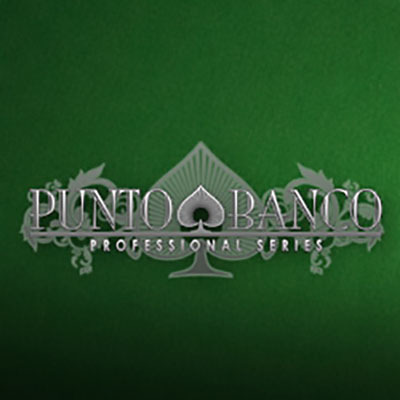 Punto Banco Pro gives players a fantastic chance to play a very popular card game and win big. The online version of the game successfully translates from the table to the screen and NetEnt have developed a slick, easy on the eye design for you to enjoy. Unlike some complex card games, punto banco is simple and easy to play, with this online version allowing you to experience a trip to the casino all from the comfort of your home.